The international “symbol of love” has been around for generations, but when did the custom of wearing a ring to symbolize marriage come about? I did a little research and though the exact origin is unknown, historians seemed to primarily believe ancient Egypt started the tradition most like our modern wearing of a wedding band. Archeological discoveries, some dating back more than 3,000 years ago, led them to this conclusion. Imagery on artifacts, such as papyrus scrolls, reveal an ancient culture that exchanged rings braided from reeds and hemp, and sometimes gold or silver wire. Through translated hieroglyphics, experts learned how this society viewed the circle as a symbol of endless love between a man and woman. Additionally, Egyptians wore wedding bands on the ring finger of their left hands. They believed this finger held a special vein directly connected to the heart. The concept was passed down to other cultures, and centuries later, it was coined by the Latin term “vena amoris” or vein of love. It was not until around the year of 860 when Christians used a ring for marriage ceremonies and it wasn’t the plain band as we now know it, it was decorated with doves, lyres or linked hands. Later on, this idea of a heavily decorated ring on the hand was considered “heathenish” by the Church and thus was discouraged, though not completely discarded. Later on in the 13th century, a much more simplified version of the ring was given during marriage, and during that time, Bishop Durant stated the ring represented the spiritual “union of hearts.” In England and Ireland, they felt that a ring was necessary during marriage, that even if the groom was too poor to purchase one, he rented one during marriage. The first well-documented use of a diamond ring to signify engagement was by the Archduke Maximilian of Austria in imperial court of Vienna in 1477, upon his betrothal to Mary of Burgundy. The ring was thin with diamonds set in the shape of an “M.” This then influenced those of higher social class and of significant wealth to give diamond rings to their loved ones. Victorians would make their rings spell out names or endearments, such the word “Dearest” on the ring set with a sequence of diamonds, emeralds, amethysts, rubys, or emeralds. Parts of Continental Europe place the ring on the fourth finger on the right hand, instead of the left as we do here in the US. 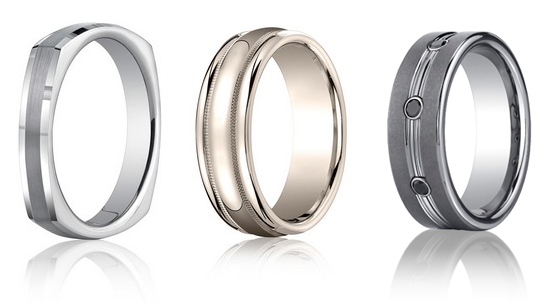 By wearing rings on the fourth finger, a married couple symbolically declares their eternal love for each other. This has become a matter of tradition and etiquette. 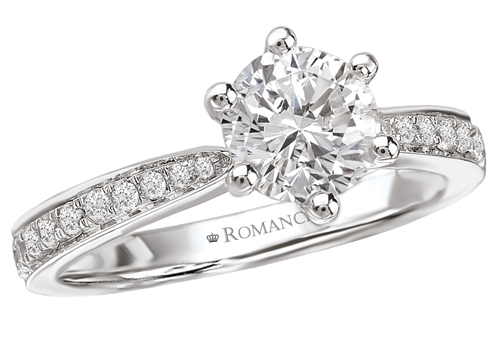 See our selection of engagement rings and wedding rings online here. This entry was posted in Diamonds, Jewelry, Jewelry History, Jewelry News, Jewelry Trends, Jewelry Trivia & Facts, Wedding Rings and tagged diamond ring, diamond wedding ring, diamonds rings, engagement ring, history of wedding rings, Jewelry, wedding band, wedding rings. Bookmark the permalink.